Two weeks after being diagnosed with breast cancer, ABC News reporter Amy Robach updated her colleagues with an email updating her status and offering thanks for all their support during a difficult time. 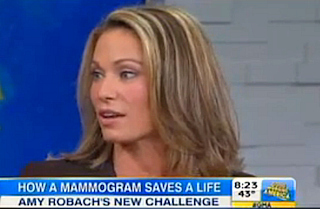 Robach underwent a mammogram live on Good Morning America before finding out a month later that she had breast cancer. She has taken time off from broadcasting to undergo a bilateral mastectomy. It may be cold and gloomy outside today but it is warm and sunny in my world. This message is long overdue…it has been weighing heavily on me how much gratitude I owe each and every one of you. The unbelievable outpouring of support from ABC began from the first moment I received my diagnosis. Phone calls, emails, cards, flowers, blankets, care packages, food, pajamas, slippers, help with insurance, medical advice….The list goes on and on…It was truly overwhelming how many of you thought of everything anyone could possibly want or need during a time of medical crisis. It brought so many tears of joy to my eyes and warmed my heart more than you’ll ever know to see what my ABC family did for me and for my entire family. In fact, there have been so many emails, it may take me weeks to get back to each and every one of you! Physically and emotionally I have been through the ringer, but I am emerging on the other side so much stronger. I have a greater appreciation for life, for health and for how such simple acts of kindness can be so incredibly powerful. I am looking through a different lens now…and I am thankful for that as well. There was my life before October 30th and now my life after. My prognosis is good, I got very lucky finding the cancer through our ABC sponsored mammogram and I got lucky choosing an aggressive approach, bilateral mastectomy, because while in surgery last week my surgeon found a second, undetected malignant tumor. No MRI, no mammogram, no sonogram had found it…it was only through the mastectomy that she discovered it. My cancer had spread to my sentinel lymph node, but not beyond, so I will have more treatments ahead of me, but none that will take me out of work. As of right now, I plan to head back into the building Monday, December 2nd and I couldn’t be more excited to get back to work. Your support and love has made this all an experience that has given me the strength to fight the fear and hopefully help others do the same in the days/weeks/years to come!